Wow. The Legend of Korra really knows how to do a finale. There is so much to talk about between Kuvira and Korra's final showdown, Team Avatar defending Republic City—and of course, that thing that happened at the very end. We're sad to see this show go, but we're delighted with the way it went out. I'll admit, a small part of me is in denial that The Legend of Korra is over. Book 3 and Book 4 have truly felt like a year-long television event, taking the characters and themes from the shakier first two seasons and building them into a phenomenal story. It's hard to believe that I won't be here with you all next Saturday talking about the latest episode. But what a way to go. Let's start at the beginning. We pick up immediately after the last episode left off, with the team dusting itself off after Kuvira tried to blast them with the death ray attached to her Colossus. Everyone managed to survive, but things are not looking good. Kuvira has her death ray and her army, after all. But Korra, she's got her friends. That may sound hokey, but it's truly striking how alone Kuvira is even amidst her army. At the start of the season, she had Baatar Jr., Bolin, Varrick, and Zhu Li by her side. Now it's just her and her nameless soldiers. Kuvira has no confidants, no brain trust. She has minions, but no allies. Even Baatar Jr. has come to realize the error of his ways. By contrast, Team Avatar is a perfect ensemble. In the initial attack, Meelo has the brilliant idea to fill water balloons with paint and the Airbenders splatter them across the Colossus's windows, hampering Kuvira's vision. Bolin uses Lavabending to throw the machine off balance while Wei and Wing tie the legs together. Everyone, including Korra, puts up a good fight, but between Baatar's engineering (windshield sprays, good plan) and Kuvira's ultimate weapon, the team ends up retreating. Fortunately, the tech team is still at work. Varrick and Zhu Li improve Republic City's odds by shutting down several of the smaller Earth Empire mech suits with an electromagnetic pulse. And when the team regroups at Asami's office, Lin brings along a special guest engineer: Hiroshi Sato, whom she's freed from prison. Now, the man who once fought for his Equalist ideology is fighting for his daughter and the city they both helped to build. Asami seems relieved to let go of any lingering resentment for her father, their relationship repaired with welding and tender declarations of familial love. The bigger love story, though, is Varrick and Zhu Li's. After failing to fall to his knees and kiss Zhu Li's feet last episode, Varrick is finally ready to tell Zhu Li how much he appreciates her. And he doesn't just appreciate her—he loves her. He presents a delighted Zhu Li with a carved jade ring and asks if she'll do the thing for the rest of their lives. Somehow, he manages to make it not sound dirty. As I watched the finale, I found myself thinking back to Book 2 a lot. That was the season when our characters spent a great deal of time apart and neither they nor the show were at their strongest. As individuals, the characters trudged through dreary romantic and familial drama, and were pushed around by powerful personalities like Unalaq and Varrick. Together, they are strong and a joy to watch. Everyone does their part. Baatar Jr. provides intel on the Colossus. The Benders slow it down while the tech team finishes the suits. Characters who don't often get to save the day, like Meelo and Ikki, perform clutch rescues. Once the hummingbird mechs are finished, the tech team uses Hiroshi's plasma saws to cut into the Colossus's platinum skin. Tragically, while Hiroshi and Asami's mech is cutting, the Colossus does something Varrick predicted: it squishes the mech like a mosquito. Hiroshi ejects Asami while he makes the final cuts, so she witnesses his death in mid-air. Hiroshi's plan outlives him, however. Korra leads a small team inside the Colossus divides up the tasks. Su and Lin go after the death ray arm. Mako and Bolin go for the Spirit Root power supply. Korra races toward the head to take down Kuvira. Mako has struck me as a bit of a lost character over the last couple of seasons. It seems that, once the romance plots died, the writers weren't entirely sure how to treat Mako. Throughout Book 3, he was the other half to the sharper, funnier Bolin, while occasionally casting a wary eye toward Kai. His role this season was stronger, but it was because he was more firmly planted in the straight man role against Prince Wu. In the finale, though, Mako gets his moment. When he and Bolin aren't able to shut down the Colossus' power supply, Mako suddenly realizes that the only thing he can do is zap the root with lightning until it explodes. Years ago, we might have seen a more macho Mako throwing himself into danger, but there is no chest puffing here. Mako almost seems to curse himself for realizing that putting himself at risk is the only solution. Bolin, of course, isn't happy about it. Fortunately, although Mako takes a bolt of energy to the gut, he does manage to overload the root, and Bolin drags him to safety before the Colossus explodes spectacularly. Before we get to what else went on inside the Colossus before the big boom, let's take a moment to talk about Prince Wu. Not everyone made it out of Republic City before Kuvira's attack, and Pema finds herself babysitting a bunch of stranded civilians. Pema is such a mom, and she tries to placate the crowd by singing songs and playing games that I'm sure have served her well on long Air Bison rides. Just as the would-be refugees are about to rebel, Prince Wu shows up with a pair of Badgermoles he liberated from the Republic City zoo. In an episode that otherwise tied in with the show's themes and characters together well, the Badgermole business was way out of left field. But I get it; Wu needed a heroic moment in order for his ending to be a satisfying one. And I guess if a guy tries enough hair-brained plans, one of them is bound to work. The Badgermoles even take down a couple of Earth Imperialists in mech suits thanks to Wu's terrible singing. Back inside the Colossus, the fabulous Beifong sisters mess with the death ray, Metalbending the loading system until the weapon is useless. Kuvira has the Colossus pull off its own arm, hurling the death ray into the Spirit Wilds. So when Korra shows up on the bridge, it's not Korra vs. Colossus; it's Korra vs. Kuvira. The two women are much more evenly matched now than in their last duel. It helps that Korra is no longer seeing visions of the worst moment of her life when she looks at Kuvira. And when the Colossus goes boom, Korra figures it's over. But Kuvira isn't ready to surrender. Kuvira, in her desperation, flees into the Spirit Wilds and finds her death ray suspended from the vines. She still thinks that giant gun can somehow solve her problems. But once she fires it at Korra, the woman who thrives on control realizes that she can no longer control her weapon. Kuvira is thrown to the ground, but just as the death ray swings around to obliterate her, Korra does what an Avatar is supposed to do. She protects Kuvira. Entering the Avatar state, she forms a shield around herself and Kuvira, until the buildup of the energy causes Republic City to go all Akira for a moment. But Republic City isn't completely destroyed. Instead, a Spirit Portal opens up in the middle of the wilds. And Korra and Kuvira are on the other side. When Korra and Kuvira first dueled, at the end of the battle, Korra saw an image of her poisoned self projected onto Kuvira's face. Now, as she awakens in the Spirit World, Korra sees first a reflection of herself as she is now, short-haired and all. When the reflection disappears, Korra realizes she is looking at Kuvira, and Korra's recovery arc starts to crystallize. This is the real confrontation that we were waiting for. 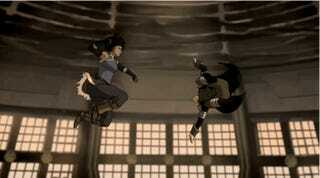 We knew in the beginning that Korra could not completely resolve this situation with her fists and her bending. She'd have to win hearts and minds—or, at least one heart. Kuvira, she realizes, had an unstable childhood and so chaos always made her uneasy. And what Kuvira says is true: When the Earth Kingdom was in shambles, no one stepped up. Korra couldn't, Su wouldn't, and the world leaders were at a loss for an alternative solution. So Kuvira took control herself to give herself a sense of security. But as she turned chaos into order, she only craved more and more control. It turns out that this was what Kuvira really needed all along, not appeals to reason or decency or loyalty. She needed someone to understand her so that she could finally understand herself. So the finale of Book 4 finds the world once again changed, and Kuvira changed as well. She surrenders calmly and willingly, her clipped tone softened with weariness. Su isn't quick to forgive, though, promising Kuvira will pay for her crimes. And life moves forward. Varrick and Zhu Li have a splendid wedding, with Bolin officiating and reading the slightly disgusting vows (and revealing the couple's full names!). The wedding reception also has some great moments with Tahno playing the trombone in the jazz band and Ikki gleefully dancing with a reluctant Huan. But the biggest surprise (for the characters, at least) comes when Wu quietly tells Korra and Mako that he's dissolving the monarchy. Phew. I was hoping that Wu would decide to step down in the end, but his daring feats of Badgermole heroism briefly had me thinking that he'd end the series on the throne. Hey, maybe there's a lucrative career in Badgermole wrangling ahead of him. Seriously, I was on the edge of my seat waiting for a smooch to happen. What happens instead is that Korra and Asami decide to take a vacation together to the Spirit World. So they pack their bags, link their hands, and look deep into each other's eyes. Sorry, folks. No snark text on this image. It's just too pretty to ruin. However, I am of two minds about this ending. On the one hand, it's revolutionary to have a TV show end with two women who have an intense relationship walking off into the sunset…er, Spirit Portal. It's even more amazing to have it happen on a relatively all-ages superhero-ish show. And I'm delighted to see many of the gay and bisexual women on Twitter talking about how they can see themselves represented in Asami and Korra. But I couldn't help comparing this moment to the ending of Avatar: The Last Airbender, where Aang and Katara share a passionate kiss. The Legend of Korra frequently parallels Avatar: The Last Airbender; hell, they even end their series finales with the same Chinese text. That's why I'm a mite disappointed that Korra and Asami don't get a similar kiss. Perhaps I'm expecting too much, but there's a whiff of plausible deniability, as if people who don't like the idea of two fictional women in a relationship could say, "Well, they didn't kiss. That means they're just very good friends." I suspect this isn't the last I'll write on the subject, and I'm looking forward to talking to people about the ending over the next few weeks. But look at those two. They're clearly in love.